The last few weeks I have been asking you to take a closer look at what visions you want to bring into form, what you want to let go of in order to make the space to do what your heart and soul desires, and to be really discerning where you spend your time. And if you are anything like me there are lots of choices, lots of directions we can go in our life and our business. Sometimes we don't always trust the answers our Inner Muse is giving us, or we don't listen and we let our heads run the show, because when the Muse is running the show she usually keeps some information in the mystery, because that is how she rolls, that is what keeps life exciting, and not everything is laid out for you in a guidebook or a map. But your brain definitely wants proof that if you do the steps or the to-dos there is a guarantee of the outcome. But that is not truth. And I invite you to do the same when making these kinds of decisions. Because not everything is yours to do, not in your work, not in your life. There have been a lot of things I have done, skills I have learned, courses I have taken, and in the end I decided, no that is not mine to do. Bodywork and plant medicine for example. I am so glad I learned those things because they were steps on the path, but they are not my work to do in this world, BUT I know enough to connect people with the people whose work that is to do, and that are magical, masterful, and have healing superpowers in those realms. One of the things that is mine to do in this life is to connect people. So if you are sitting with your vision board, or however you bring your visions into visual form and create life force focuses out of them. Now is the time to ask the question. Is this mine to do? How do you know you can trust the answer? 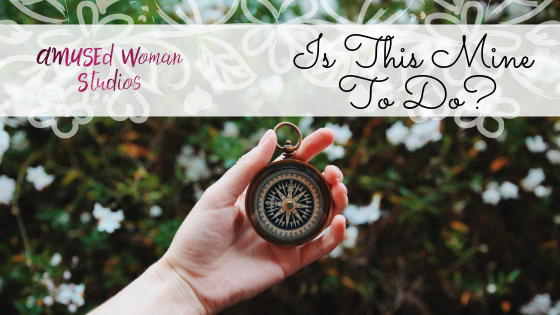 By how it feels in your body, learning to discern between a hell yes and a hell no. Or sometimes it is that whisper, or you just know. You may get a yes, and so there is a part deux to this question. Is this mine to do, right now? Maybe there is something or many things on your list that are dream seeds, and that are yours, but we don't have the energy to nourish every one of them, or perhaps you need to grow an audience, or an area of your life and business before putting this dream seed out into the world. But it is still something you deeply desire to do, that your soul is calling you to do. That is where Divine Timing comes in, and trust me, learning the skill of Divine Timing takes time, and one I invite you to be gentle with yourself about. Because I certainly don't get it right all the time. But there is no way to know the answers to this without slowing down and checking in. But when you are in flow with your own rhythms, with nature's rhythms and Divine Timing, and that of your beloveds, you usually get it right. You just have to "ask the question" and be OK with the answer and not chase and force. We often want to give up because things aren't happening, when and how we want them to, but often it is because we do not having Divine Timing on our side. Slow down, listen, and act when it's time to act and you will see that things will happen, just maybe not the way you thought they would look, or when. So don't give up. Unless of course, your wisdom says, "no sweetheart, that is not yours to do, your magic and your superpowers are over here, give xyz your attention, and focus and the energy will begin moving in the right direction." Listen to that voice. Honor that voice, trust that voice. Every Tuesday I go live and take these inquiries and go deeper and give some practices to go along with the writings in my group. Please join us!